In the first leg, the longest one, there are no large inhabited centres, so greater tenacity and resistance are required. From the British Cemetery of Torino di Sangro, just 1 km away towards the North-east, you take the left hand trail which leads deep into the Natural Reserve of Torino di Sangro. Passing by its visitor centre and after crossing the SP119, you go downhill towards the river Sangro which runs along the right bank to mouth of the river. You leave the trail near the former railway bridge, turning first to the right, and then to the left to cross it. This short passage, running parallel to the Adriatic coast on the Green Trabocchi Way, gives unique views of the mouth of the Sangro in preparation for for the next turn. 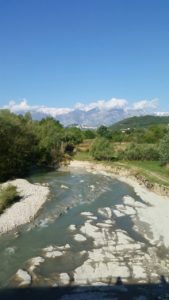 Just beyond the underpass of SS16, you turn left onto a white road and after a few hundred metres you turn back towards the sea and start to embrace the lowlands of the lower Sangro, the hills and the Majella mountain in the distance. The road crosses cultivated land, vegetable gardens and olive groves. After passing the quarry, continue on Via Lungomare and after 1.2 km, turn left at the fork, and then you walk on Trattuto del Mulino street. Once you take the underpass of the SP for the Sangro, you leave the ruins of the big Mill of Fossacesia on the left and proceed up to where you cross the railway lines of Torino di Sangro to Paglieta. At this crossing, you turn left proceeding parallel to the railway tracks for about 700 metres and, just before the A14 overpass, you turn left again. After about 800 metres the trail heads back south-westward, and from here you follow the white dirt road for about 3 km, proceeding straight ahead at the following 3 crossroads, keeping to the right at the first crossroad bend, and the left at the following one. The trail joins the tarmac road, crossing it and proceeding towards Contrada Guastacconcio in the territory of Paglieta. After passing a group of houses, keep to the right at the bend, you head north-westward. After about 100 Metres from the bridge over the railway, you turn left and immediately turn right, crossing by the underpass of SS652 and the SP Casoli-Fossacesia, and finally start uphill heading towards Contrada Castello di Sette di Mozzagrogna. Once arrived at the castle, summer residence built by the Longobardi Counts from Chieti in the 10th century and now transformed into a hotel, you follow on the first road on the right. At 300Metres far from the crossroad, you’ll be able to replenish your water bottle at the Fonte di Sette fountain and rest in a pic-nic area. From here you proceed on the road for about 900metres and then you turn left. The trail goes south westward on Contrada Serre, in the municipality of Lanciano. For 3km you continue going straight and then you turn left. After 300 metres, at the crossroad with the SP Casoli-Fossacesia, you keep straight ahead, in the direction of SS652. 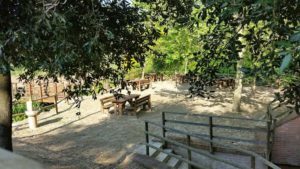 When you get to the square, near the main road, you turn right, following the path along the left bank of the river Sangro, inside the Mozzagrogna Wood, which is a site of forestry interest with dense vegetation, quite rare in Abruzzo. After passing through the underpass on the SP Lanciano-Atessa, the trail goes on straight ahead for about 2km, at the end of which you must turn right and proceed for a few hundred metres to face a short deviation, before finding yourself once again on the dirt road on the left, The road continues between cultivated fields and the ravine wall which limits your view to the right, this leads along the last 2 km in the territory of the Natural Regional Reserve of “Lago di Serranella”. 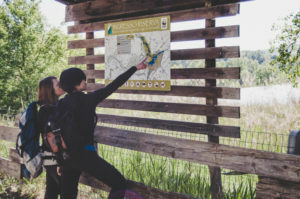 It’s a protected area of great naturalistic value at the joining of the Sangro and Aventino rivers, in the municipalities of Altino, Casoli and Sant’Eusanio del Sangro.